Review written by and copyright: Rick Curzon (25th November 2018). Trenchant comedy drama of the period; extremely well done for those who like these kind of things and a true cinema classic. I found it somewhat hard to relate to anyone in it so it left me a bit cold, but it's undeniably beautifully done. Everyone is operating at the top of their game. Shot in the matted ratio of 1.85:1 in inky black and white, Georgy Girl looks very generally sharp on Powerhouse Films new disc although being an analogue filmed production some softness is inherent. As with the other black and white films the company have handled, there is a deft balance of contrast and brightness displaying plenty of highlights and lovely, velvety deep blacks with no signs of unintended crush. The contrast ratio is so good details in some of the darker areas still stand out and background details are clear when they should be and closeups display skin and fabric textures pleasingly. Grain is very fine with the encode handling everything supremely well. No clumping or holes to distract, no digital splats even when the viewer sits extremely close to the screen or is watching it projected. The only notable flaws being at moments where optical fades between shots are used; density levels fluctuate at scene changes and in the opening and closing credits sequences. There are no signs of print damage that I noticed watching from a distance of approximately ten feet on a 4K display; it would seem the source materials have been looked after beautifully. To my eye there are no signs of any digital tinkering, such as DNR or edge enhancement. As usual, a typical mono track of the period which when heard by younger, modern ears will no doubt seem very retro and flat but it gets the job done. There is some use of base and music is never conflicting with dialogue, at least not to any worrying degree; there are no sibilant issues or moments of distortion. Subtitles are welcome and essential for the hearing impaired. Dense, info packed commentary recorded exclusively for this release and Ellinger knows her stuff. Well worth a listen, especially as I found the film not entirely to my taste but hearing about it was more involving. Italian, French and American films. Many will also be aware of her recent TV work in Chris Chibnall's Broadchurch. Nichols discusses the origins as a book by Margaret Forster. She adapted it but the producers weren't happy with her draft so Nichols was brought onto the job having just working on Catch Us if You Can (1965). This was very much a job for hire with good money but it was more Forster's baby than Nichols (The National Health). It was interesting to hear that Vanessa Redgrave passed on the lead role and then her sister took it and ran with it. Lengthy interview with the editor. The film was going to be edited by Fred Burnley who went on to direct his first documentaries, so Bloom got the job. Lots of stories about the producer, the director who gave Bloom lots of freedom to do his job and to experiment. Short piece about Woollard's approach to production design and his experience working in B&W and how that impacts on the approach a designer takes towards a job. An audio piece set to images from the film. The theme tune is arguably more famous than the film these days. We hear comments on it's genesis and how editor John Bloom used "Funny Girl" as a temp track and but the rights were too expensive (more than the cost of the whole film). Lyricist Jim Dale also is heard discussing his approach to the material. Vintage advertising pieces; no surprises (in HD). A nice, if brief collection of promo images in HD. Another superlative booklet from Powerhouse Films. If you've been collecting these discs you know what I mean; nuff said. 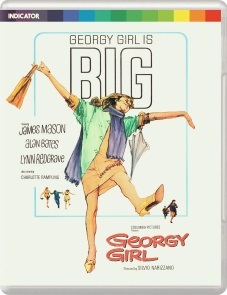 Powerhouse Films release of Silvio Narrizano's classic film Georgy Girl is a winner in every way with excellent picture and sound. As far as I'm aware this transfer uses an off the shelf master which is in fine condition and the encoding is spot on. Extras are extensive and of high quality and certainly enhance enjoyment of the film.